I’m so proud. 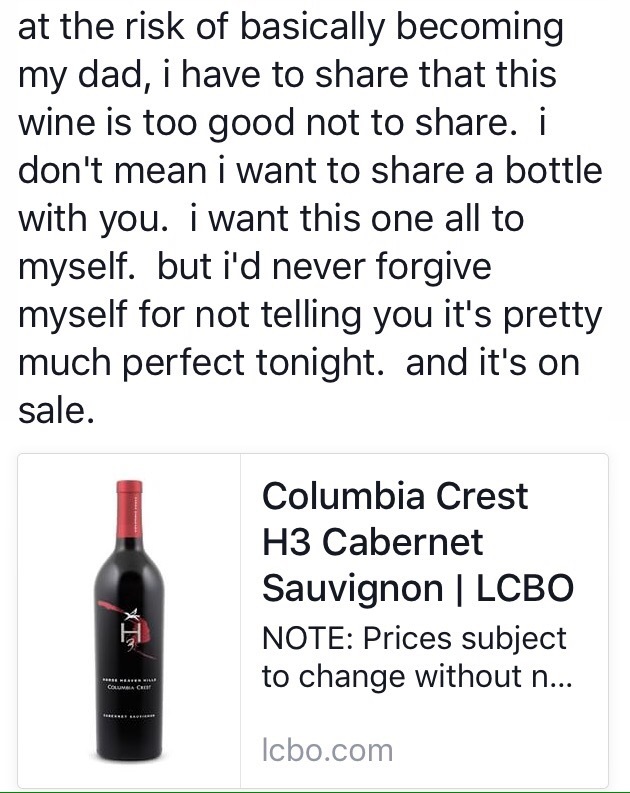 My daughter M posted on Facebook about how much she loved a wine I bought for her and sounded like me on my blog. Just pure fun. No tasting notes … other than “this wine is too good not to share”. Also, she hashtagged #pullthecork #moveoverpapa – that’s just funny. I may leave the blogging to her soon. And I did go out and buy 2 for Casa Oke. This entry was posted on Thursday, April 28th, 2016 at 7:07 pm	and tagged with American wine at the LCBO, Cabernet Sauvignon, Columbia Crest Cabernet, H3, Horse Haven Hills and posted in LCBO Quick Pick list, Wine writing. You can follow any responses to this entry through the RSS 2.0 feed.